Teased last month with nothing more than an image of exhaust pipes and the codename ‘P15', McLaren’s ultimate road-legal track car has been revealed. Named ‘Senna’ in honour of the legendary Formula One driver, Aryton Senna, McLaren say that this is their most extreme road car to date. Built with the same focus on performance as any of McLaren’s racing cars, the McLaren Senna is more a racing car that happens to be legalised for road use than a road car that’s quite good on track. Power comes from a mid-mounted 4.0-litre twin-turbocharged V8 that produces 789bhp and 590lb ft – these figures make it the most powerful internal combustion engine that McLaren have ever put in a road car. Much like one of McLaren’s racing cars, performance figures have not been released along with the McLaren Senna, but you can safely assume that the 789bhp combined with a dry weight of just 1,198kg will add up to some fairly sensational figures. Talking of the 1,198kg dry weight; McLaren Senna is the lightest McLaren road car since the incredible McLaren F1 road car that held the title of world’s fastest production car. The low figure comes thanks to McLaren Senna featuring McLaren’s carbon fibre Monocage III chassis and body panels that are entirely made of carbon fibre. 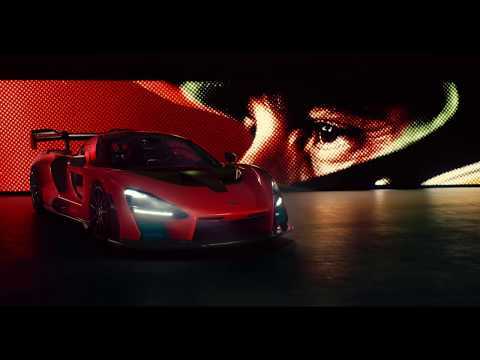 Incredibly McLaren Senna boasts a power to weight ratio of 659bhp per tonne. When looking at the exterior of the McLaren Senna, it is clear to see just how focussed on performance this incredible vehicle is - aerodynamic efficiency is key. To this end, McLaren have introduced what they call ‘a new generation of ground-breaking front and rear active aerodynamics’. Every single part of the McLaren Senna, from double diffuser to the entire rear clamshell, has been specifically designed to play a role in the creation of downforce or additional stability whilst out on the race track. Practical aerodynamic design aside, all of these features also work to make McLaren Senna one of the most exciting McLaren’s to look at – you can see why McLaren reference this as their most extreme road car ever. Building on the extreme aesthetic of the racing car body, there are all sorts of little details across the car that give an added sense of drama; one such element is the transparent lower window in each of the dihedral doors. On the interior, the ethos of uncompromised performance continues due to the stripped-back nature; in true racing car style, McLaren included nothing that is not functional or important. Interior carbon fibre has been left exposed to save weight whilst the one-piece racing seats feature a minimal amount of either leather or Alcantara padding – the choice being customer preference. Driver controls have also been kept to a minimum (even the steering wheel has zero controls on it) in order to allow the driver total focus on the road or track ahead. The McLaren Senna falls into McLaren’s Ultimate Series of cars and will be strictly limited to just 500 examples. The car will make its public debut in March at the Geneva Motor Show – something that we’re very excited for. What do you think of this outrageous new road-legal track car from McLaren? Let us know on Facebook, Instagram and Linkedin. Can't wait for the P15 or BP23? Why not take a look at the existing new car range.